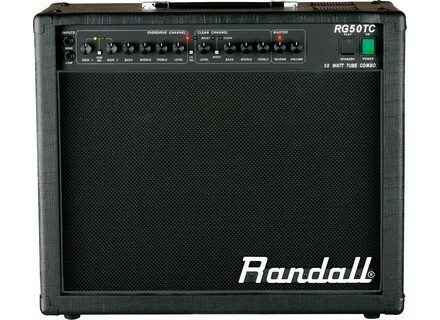 RG50TC, Tube Combo Guitar Amp from Randall. Fifty watt 1x12 combo with EL34 power tubes. Comes with a Celestion speaker. Two channels, one clean and one dirty, but each channel has two modes. Clean has a boost switch and the gain channel has a 'vintage' gain and 'modern' gain switch. Has jacks for extension speakers and fx loop. I've been playing guitar for approximately 26 years and I've owned tube amps like a Marshall JCM 800, Peavey 5150 and a Mesa/Boogie Subway Rocket. I've also owned solid-state amps like Marshall Valvestates, a Peavey XXL and an old Randall RG100 head back in the '80s. My choice of music is classic metal like Iron Maiden, Black Sabbath, Rush, Judas Priest, Accept, Dio, Savatage, old Slayer, old Metallica, old Megadeth etc. I bought this on clearance for $480 from Hollowood Music in McKees Rocks. I wanted something small and portable yet still had a pretty killer distortion. I tried a few other amps like Line 6 which was too digital sounding, a Peavey JSX combo which is an awesome amp but unfortunately out of my price range. The first thing you'll notice about this amp's tone is that it's not the solid-state Dimebag sound that is so often associated with Randall. It's also not very 'modern' sounding like a Mesa or Engl or even some newer Marshalls that have a compressed, scooped-mid sound. With four 12ax7 tubes in the preamp and 2 el34 powertubes, this thing pretty much screams Marshall JCM800. I used a Les Paul guitar with EMG 81 pickups so the active electronics of the guitar pushed the amp into an aggressive metal overdrive, but if you're using passive pickups, you'll need a distortion pedal to get into the metal zone. The clean channel by itself is useable, although you're not going to get classic Fender. The boost function on the clean channel adds some dirt and does a great bluesy, Marshall Plexi-type sound. I ran a chorus pedal with the clean boost and it copped a Robin Trower 'Bridge of Sighs' tone pretty impressively. This amp is a 'one trick pony', with that one pony being a Marshall clone. If you're looking for a multi-channel amp that goes from Fender sparkle to bluesy Marshall overdrive to modern Mesa mayhem, this isn't it. Scooping the mids in an attempt to get an aggressive thrash metal sound results in a tone that is thin and buzzy. Also, for 50 watts, this amp is not very powerful. The lack of headroom is frustrating wih the clean channel. Playing with a totally clean sound is almost impossible, especially at band/gig volumes as the amp wants to distort. Of course, it could have been my active pickups driving it harder. This amp was made in China, so corners have been cut to keep the price reasonable. The knobs aren't very sturdy feeling and the tubes are protected by only a plastic grill. However, I used this amp on a regular basis for over a year -home use and jam sessions at people's houses-and never had any problems with it. Back in the 90s, nobody wanted a Marshall JCM 800-everybody wanted Mesa Rectifiers. I paid $500 for a used, excellent condition 50 watt JCM 800 head back in the late 90s and I wish I never parted with it. Now that Kerry King and Zack Wylde have made JCM800s popular again, the price of these amps has escalated. The Randall RG50TC would be a good choice for a beginner or mid-level amateur who wants the vintage Marshall tone without paying the price of a real Marshall. It's lack of power and tone options keeps it from being a serious gig amp, but it could do the job for small jam sessions. Unless I came across one for a very low price, I wouldn't buy it again. 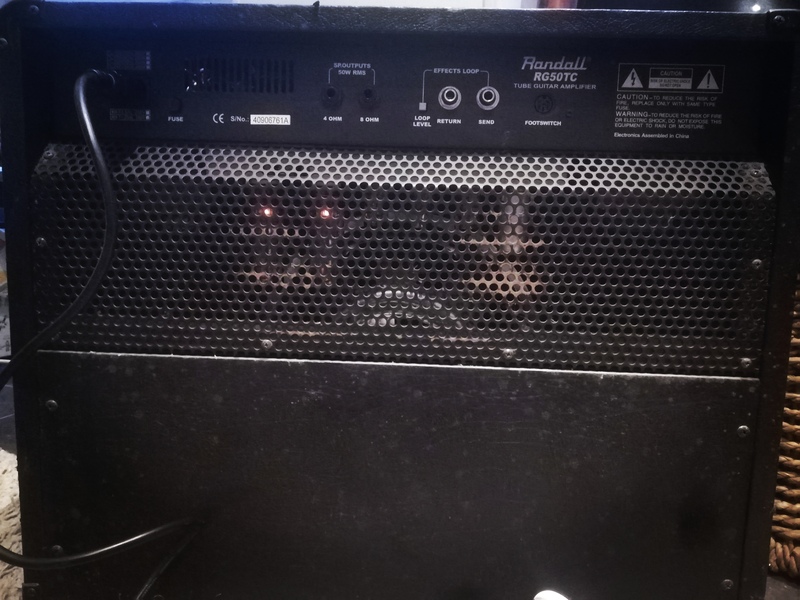 iamqman's review"Nice combo for tone and money"
Randall is a company that has taken the modular preamps by storm. They have build a market for preamp swapping that has ignited the guitar players around the the world. Though this amp is not a modular design it still incorporates the sound and tone that makes Randall power amp a thing of the future. This is one classy combo amplifier. This design has two channels with three modes. The overdrive channel has a vintage and modern switch. It has external speaker outputs to hook into a 2x12, 4x12, or any other separate speaker cabinet. The 50 watt version is a little bit more spongy than the 100. SImply because there will be lesl headroom and the amp with distort quicker. Their distortion channels is what Randall does well. These two channels or one with a twist has enough gain for just about anybody out there. It is a thick and juicy distortion that is great for chugging and lead riffing. Randall makes one of the best distortion in the business and this is one of them. The clean on Randall are somewhat unique to my ears. They have a Marshall or British style voicing to them that is not that appealing to me. I have never liked a Randall clean channel. It is better than a Splawn that is for sure. The clean is sort of a harder clean that doesn't sound that glassy to me or even reminiscent of a Fender tube amp. At new these amps come in at around $560, which is a good deal for a solid tube amp with multiple channels. You can find them on the used market as well for much less. I would recommend this amp to someone who wants a decent clean channel and an over the top distortion channel for vintage playing styles ad new modern playing. This amp is very versatile and will serve its user quite well. FX loop, two speaker outputs (4 and 8 ohms). Two channels: clean plus dual lead (two very different sounds). Great if you like a big sound! You'll easily get a great sound! I never had such a good sound. Review from 2006... I've found better. But I like it anyway. Good amp for death and thrash metal, rock and grunge. The clean sound allows you to play jazz and blues... You can play everything with this amp from crystal-clear to extremely distorted and crunch and mellow overdrive. The reverb doesn't have the same quality but it's enough to have fun. Update from 28 September 2007: This amp doesn't sound good with every effect pedal... I own a HM-2 and it sounds good only in the FX loop... Which is normal, the clean channel is not amazing... A bit dirty and the more I play it, the more I think about buying an amp with a better clean sound. But considering the price, this amp was an excellent choice, especially for a metal freak. I bought it June 2006. I've been owning it for few days and it's a true delight. (I would prefer a metal grid to protect the speaker better). I tried out a Marshall Valvestate, two Vox (AD50VT and AD15VT) and a Marshall MS-2. This morning I played an RG Prestige with a Marshall AVT 100W stack. And I received this amp this evening. I plugged my ibanez with SH8 pickups into it... and surprise: The sound was much better! (and my Ibanez looks more beautiful). A delight! Compared to Vox models, this amp sounds twice as better. Compared with the Marshall models it's ten times better! I'm very happy. Excellent value for money: you get tubes for the price of a solid-state amp. I love the warm and dynamic sound of this combo! 28 September 2007: The amp broke and I'm not sure about it's reliability. It's pisses me off because I'm a fan of this amp (see my highly praising review) but I can't recommend it if it's not 100% reliable... Perhaps I'm unlucky. I will decrease the mark because of this. Update: I finally replaced the high-voltage fuse of the reverb tube and the amp worked again. I was worried without reason. So this amp seems to be a good deal... Good distortion. It's a bit like a 5150: fat distortion, crunch and average clean sound. The distortion sounds a bit British. I usually tune in B and this amp matches it perfectly. This small Randall is only ok! I'm thinking about buying something else (quite normal after 5-6 years). It's ok if you want to have fun and play two gigs per year. Easy configuration, 3-band EQ on each channel, boost switch in the clean channel, gain switch in the lead channel. So the EQ is shared by the two distortion channels. Very easy to use. You'll get a good sound if you take the time to fine tune your settings. It's really worth its price as a whole. I've used this amp with several guitars. A semihollow-body Shecter C1E/A conceived for blues and rock. The clean sound is very muddy with this guitar due to the humbuckers and its mahogany design. But the crunch sound is quite round and nice with this guitar. It's great for blues and AC/DC stuff. The distortion is quite intense so the guitar sounds like a Les Paul with a warm, wide and rather imprecise response. 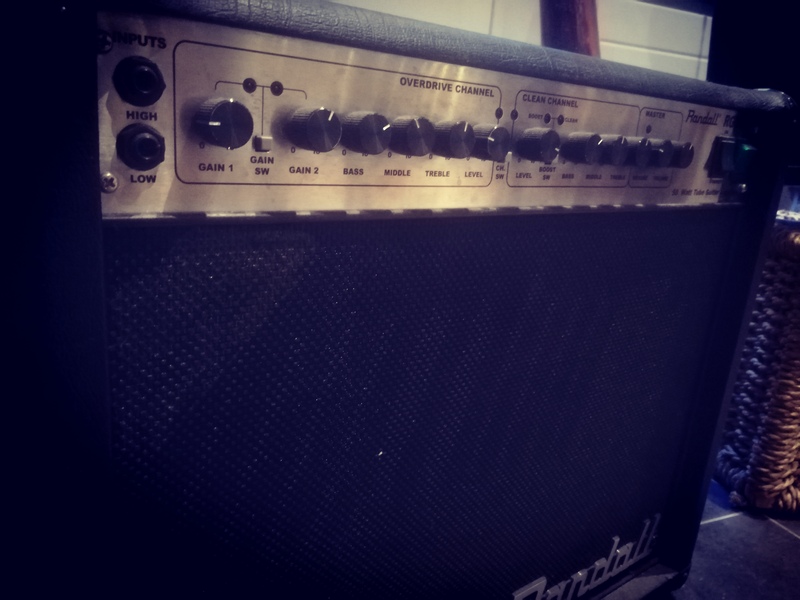 The amp sounds best with an Ibanez S-1540 Prestige. The clean sound is crystal-clear with the center single-coil pickup and positions 2 and 4. The sound is rather wide with the neck pickup. The amp is very responsive. The crunch sound is good but not exceptional. The distortion is very good: the amp is responsive, the sound is wide, ultra accurate and sharp. I love both distortion modes. As a summary, this amp is quite faithful to the guitar and to your playing. 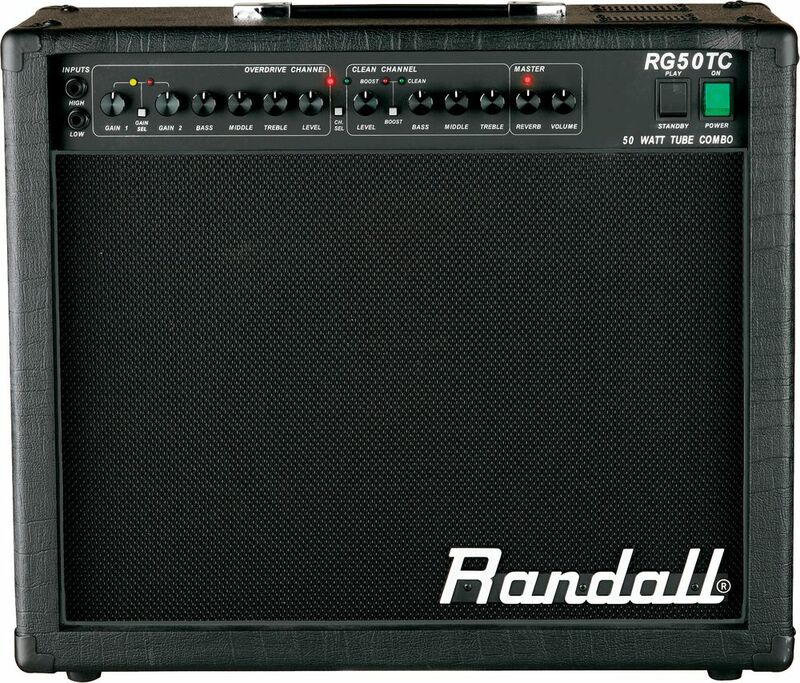 Don't forget that it's a Randall, which means that the amp's specialties are modern sounds and distortion. I'm planning to sell it because I need a more vintage sound for my band. It's a good amp. No noise, no reliability problems. I've been owning it for one and a half years and I haven't had a single problem. I would definitely buy it again if I had the same needs as in the past (a big sound). But my needs changed and I'm now looking for a more vintage British sound so I'm thinking about buying an Orange or a Vox.